According to the U.S. Bureau of Labor Statistics (BLS), growth in the legal profession is expected to reach 10% from 2012 through 2022. Tax law, in particular, offers unique growth opportunities. In 2014, the National Taxpayers Union Foundation estimated that Americans spent more than 6 billion hours complying with the federal tax code. Individuals with a Master of Laws (LLM) in Taxation or Master of Taxation (MT) degree are uniquely qualified to enter a job market clamoring for skilled tax professionals. 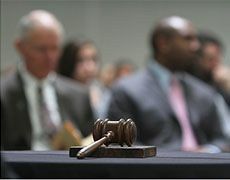 The United States Tax Court, located in Washington, D.C., employs many attorney advisers, or law clerks, to aid the judges who oversee cases. These attorney advisers may conduct legal research, draft opinions and perform many other services judges need to adjudicate cases tried before the court. According to the United States Tax Court, special consideration is given to candidates who have an LLM in Tax. A career in financial planning is another possibility for both MT and LLM in Tax graduates. U.S. News & World Report ranks financial planning at No. 25 on its “100 Best Jobs” list, and No. 5 for best business jobs. Unemployment in this field is only 2.5%, and demand is growing faster than other occupations overall: The BLS predicts 27% growth between 2012 and 2022. The BLS predicts that more than 166,000 new certified public accountant jobs will open up between 2012 and 2022, representing a 13% growth rate. CPAs are heavily recruited both by large national and international accounting firms and corporations. CPAs with an MT or JD/LLM in Tax degree can serve in both capacities, given their intensive education in taxation. The Office of Chief Counsel is the Internal Revenue Service’s law firm and offers some of the most specialized, technical and highly competitive jobs in tax law. Lawyers with LLM in Taxation degrees are given preference in the hiring process. If you are interested in pursuing a career in taxation, these four positions offer opportunities for professional advancement.